If you’re anything like me, you love boy bands, and you’re guilty of having an extremely sweet tooth (ever woken up with a craving for Krispy Kreme Donuts? No? Just me? Okay). If you share my addictions, then the latest concert promo team will be beautiful music to your ears. 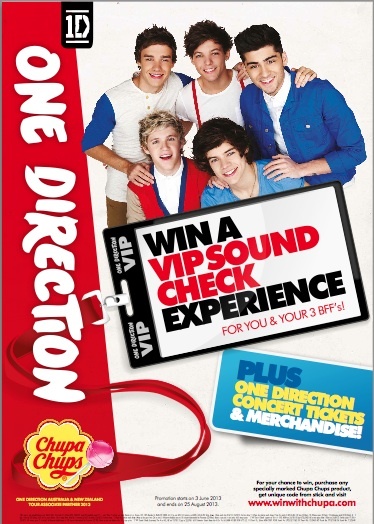 Chupa Chups, my favourite lollipop brand in the world (I could live on the strawberries and creme flavour) have teamed up with my favourite boy band in the world (well, second) One Direction for an awesome promotion. They’re giving away an awesome VIP sound check experience for you and your three BFFs (um, OMG yes! ), concert tickets, and rad One Direction merchandise. All you have to do is purchase specially marked Chupa Chups products (like that’s hard!) and head to http://www.winwithchupa.com to enter. Once you’re in the draw for tickets and merch, you can race to be the fastest to complete a special puzzle game to win the soundcheck prize. So why are you still reading this? Run to your nearest shop, buy your favourite flavour Chupa Chups, and get entering! You have until August 25th, so that’s more than enough time to master the puzzle and win the ultimate concert experience.